Is it me? Pardon my grammar, but you know what I mean. Anyone who takes the trouble to read posts 12 and 13, in which Tracey has very kindly posted the two halves of an article in which these Traveller's Rest stones were described in minute detail, can be in no doubt that, whatever else they were used for, be it mounting horses, resting coffins on, or whatever, their original purpose was quite simply for foot travellers to sit on and rest. Hence the name Traveller's Rest. Many years ago, when I first came across them, I took it that that was their purpose. Subsequently, I was told they were for resting coffins on, and that seemed plausible, because of the nature of the inscription, and the step at either end. It would have been disrespectful to allow a coffin in transit to rest on the ground, and there were also deep-seated superstitions at one time about allowing a coffin to come into contact with any land. Hence the coffin rest stones you find in some areas of the country. I believed the story about the Traveller's Rest stones being for coffins, and have repeated it, to my discredit, without checking the facts. Now that the facts are before me, I willingly admit that I was wrong, and accuse myself of applying insufficient rigour, an error I hope I will avoid in future. Curiously, when I raised this matter on a forum in St. Helens, a member whom I have respected for a long time also flatly refused to believe that, in the 19th century, anyone would pay for stones for people to sit on. Yet the evidence is there, in black and white. Truly, there are none so blind as those who do not wish to see. And, as my old Ma used to say, a man convinced against his will is of the same opinion still. Your reply has confused me a little Algy especially knowing what you are usually like re local history and solving little mysteries etc but as luasredline has already mentioned above the newspaper article that Tracey posted does clearly say what they were originally placed in the locations for and for who etc. Don't always believe what is printed in a newspaper Dizz or on a forum come to that, it all depends on opinions or perhaps I should say differences of opinion. If Lord Greenall (Bless his benevolent little soul) wanted to be thought well of he would have something nice carved into his sandstone block to impress the local peasants such as 'Travellers Rest' and all these blocks were presented to the districts by people with money as they were the ones likely dismount their hunters outside the local hostelry, it's hardly likely that the locals would go around the village asking for contributions to provide such artifacts as they had hardly enough brass to feed their families. Just my opinion you understand and if its rejected by persons with a higher interlect than myself then so be it, I certainly shan't lose any sleep over it. Gilbert Greenall was apparently highly thought of by the local community anyway as he often did a lot to help them and also gave land away for public use and for schools etc to be built on etc. The Greenalls one I posted the photo of does have 'Travellers Rest' and his name on it. Regarding the news clipping it doesn't say that locals were asked asked to fund or contribute to the Travellers Rest stones but that local dignitaries were. Saying that though the Greenalls could have easily funded the lot as I'm sure all the other wealthies of the time could have too and many of them would have owned the land anyway. At the end of the day the 'rests' were only lumps of sandstone so nothing special really and we even had sandstone quarries round here so I must admit the request for donations of 2 guineas does seem a bit odd. I approached Cheshire Life to see if they would be interested in publishing an article about these stones, but the Deputy Editor said it was not for them. Looking to find topographical journals for which it might be a more suitable topic, I unearthed quite a bit more information about Dr James Kendrick, the designer and instigator of the stones. Son of a physician, his own medical practice seems to have been a large and successful one, and he was a very prominent local antiquary and historian. It was largely due to his enthusiasm and financial support that a number of archaeological projects were undertaken in the mid-19th century which have shaped our understanding of local history and prehistory. He was a great supporter of the public library and museum, and bequeathed part of his own collection to these institutions. In fact, the museum have a photograph of him among the selection displayed on their web site. We owe a lot to wealthy, philanthropic men like him, who tried to bring some culture and a better understanding of the world to less fortunate people, for whom the reality of everyday life could be rather grim. Yes we do owe a lot to people like him and thankfully all his works were documented and are often referred to. He did masses of archaeological research work in the area as did Thomas May and I've often wondered where the stone base of the Roman Well that Kendrick discovered went as he removed it and then placed it in the Town Hall gardens. No doubt years later someone just thought it was a lump of stones and threw it away It was found late 1860's near Wilderspool in a field on the south side of the now Manchester Ship Canal. I wonder if it was as impressive as the one they found on the school grounds a few years back. One of the topographical journals I considered submitting to is that of the Historic Society of Lancashire and Cheshire, which was going in Dr Kendrick's time. Their web site indicates that they have a wealth of material submitted by this gentleman, but I can't seem to gain access to it. I'm using Firefox. I wonder if someone a bit more knowledgeable about these infernal machines would kindly take a look, and see if they can read or print back numbers, as the site seems to suggest should be possible? I would be very grateful. One article I should like to have a look at is the evocatively titled "A Morning's Ramble in Old Warrington." Good discovery about the drinking fountain. My recollection of the Bank Quay area only goes back to about 1964, when we used to catch the train for Holyhead, to sail to Ireland. Now, of course, when you approach the station along Wilson Patten Street, you swing right into Parker Street, then left at the lights and past the soap works. I wonder if this was always so? Given the alignment of Wilson Patten Street and the old Liverpool Road, the route you take to circumvent the soap works seems quite an illogical detour. I wonder if, many years ago, what is now Wilson Patten Street used to lead straight to old Liverpool Road? No idea if it might have done, but just a thought which suggested itself to me. Re my picture on page of of the Lumb Brook Travellers Rest stone inscribed with the name 'Benjamin Pierpoint'. Just wondering with you mentioning that you are planning to submit info to the topographical journals and have also already contacted Cheshire Life too but they weren't interested so do you already have quite a bit of info regarding the Travellers Rest stones that we are perhaps not aware of that would help us in our searches too? Only asking as it seems daft us looking for things and posting info if maybe you already have quite a bit of it and we are simply duplicating. Yes I can search and read past issues of the journals on the Historic Society of Lancashire and Cheshire's website. I'm using firefox too. I can't however read Kendricks 'A mornings ramble in Old Warrington' but I suspect that is just a reference to his actual book. I'm sure I remember the reference library in Warrington having a copy of it though that you could go down and read. I wonder if, many years ago, what is now Wilson Patten Street used to lead straight to old Liverpool Road? No idea if it might have done, but just a thought which suggested itself to me. there used to be a road that went under bank quay and a lower station for the east west trains. it ran through lever bros and came out at the main gate. the lower station was mainly for goods trains and also they used to take the pigeons for the races to there to be transported to the release pont. Regarding the 'Travellers Rest' stones could someone please inform me why the are made with a step cut into each side of the bock, if there sole purpose was for some foot weary traveller to sit on, would it not make sense to make the block approximately 18 inches high and without going to the expense of a stonemason cutting steps into it, also travellers ride horses and in the 1860's there were more travellers travelling by horse than were travellers walking the highways, as walking alone in those times was an extremely hazordous pastime. Dizzy, let me reassure you that, when I posted the original topic, I knew absolutely nothing about these Traveller's Rest stones, beyond being aware of the location of three of them. I was firmly convinced that they were for resting coffins on, as had been asserted with some authority by a correspondent to the local history column of one of the St. Helens local papers a number of years ago. What rekindled my interest recently was a conversation with a young ranger (would it be sexist to call her a rangerette?) in a St. Helens park which has one of these stones beside the duck pond. A nearby poster, erected since recent extensive refurbishment of the park, referred to this stone as a mounting block. I told her the coffin rest stone theory, but wasn't sure, so I promised to look into the matter so they could have their facts correct when preparing a permanent notice to display nearby. As I knew there were at least three of these stones in Warrington, a Warrington forum seemed the logical place to ask, as proved to be the case. What I now know about the Traveller's Rest stones is completely due to the good work of yourself and your fellow forumites, with a special vote of thanks to Tracey for unearthing that excellent article from 1860. My approach to Cheshire Life was just to see whether they were interested before I researched the article. If I do decide to submit something to a more scholarly journal, it will call for a completely different approach, and a great deal more research. I may put that on the long finger, as we say in Ireland. We're moving this year, so I'm going to be rather busy. Also, topographical journals are unlikely to pay anything, so what writing I do this summer had probably better be something which will attract a fee. I actually have a short story coming out in an anthology in Ireland in September. I may be sufficiently immodest to refer to it again nearer the time. Evil Sid, thanks for the information. I know that there's a site where you can view old maps, so a bit of further research seems to be called for. The steps at either end, according to the 1860 article on the previous page, were for children to sit on. Had I designed the stones, I would have made them level. I'm sure parents could have hoisted their children up beside them, while a level stone would have been more comfortable for a larger group of adults. I can't state with any authority the relative numbers of foot travellers vis-a-vis equestrian ones in 1860, but the article makes it clear that these stones were for those travelling on foot, including itinerant agricultural workers, many of them Irish, who travelled the country from one harvest to another. The provision of drinking fountains near some of these stones suggests that their intended users would have been quite poor. Those people affluent enough to be on horseback would, I'm sure, have rested and refreshed themselves at wayside inns, of which there were probably plenty along main roads. Algy - in the original article Dr Kendrick explains that is his 'medical opinion' the stones are designed to be the optimum height for a seated person to get most rest. He also mentions that the steps will help nursing Mothers (I can confirm from personal experience that a foot rest is useful when breastfeeding) He also says that lots of Irish itinerant works would walk from Liverpool out to Warrington/Cheshire looking for agricultural work. It's those foot travellers he was thinking of and hoping to line the whole route from Liverpool to Manchester with Traveller's Rests. If you read the article it says he produced a sketch plan showing how he intended for the seats to be used and that the size of the block was carefully considered in how many travellers/bags it would take. Thanks Tracey an excellent explanation and we have known each other (internet wise) for a few years now and I value both your and Dizzy's opinions without question, I do not however react favourably to a new member coming along and using hard earned researched information to pass on to national/regional publications to perhaps lay claim to the topic in question. I believe that was called Factory Lane. It may even have been there even before the railway was built. I have to acknowledge my ignorance of these stones. I have probably seen some of them but never knew what they were. That said if you had asked me what do you reckon the purpose of a travellers rest stone is I think I would have guessed at a stone for a tired traveller to rest on. No I don't think it would have because the river and its bend was in the way as always has been. Looking at my old map from the 1840's the main route to the Liverpool Road side has always been via the top of the bend near the soap works even before the time of Wilson Patten Street so that theory is out in my opinion. 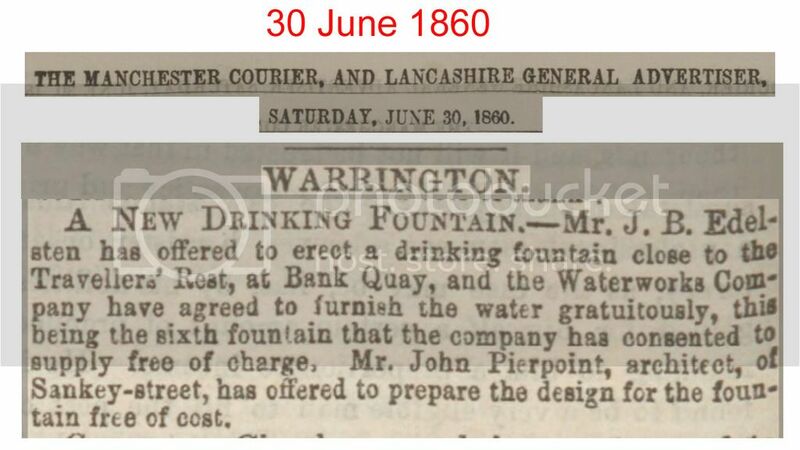 Would that have been gone towards/past the old Bank Quay Foundry and Potteries of the time ? Factory Lane features on the 1848 Town Plan.